Providing you the best range of cooling plates with effective & timely delivery. Cooling plates are the equipments which are used in the automobiles for the purpose of cooling down the engine temperature for longer running time. These cooling plates have been manufactured at our company using finest quality raw materials which are very tough and tensile and provide these plates a long lasting lifetime. These cooling plates are widely being used and appreciated in several parts of the country as well as abroad. 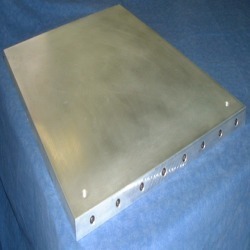 We have set a very reasonable price range for these cooling plates in the market for our clients. Looking for Cooling Plates ?